Of course you had the best intentions when you signed the lease. This was the coolest place in the city. And you were sure you could make the rent. And you were never, ever going to want to live anywhere else. Except then you decided to transfer to another school in a different city. Or you found the love of your life and decided to move into his bigger, even cooler apartment. Or your very best friend in the world (and the guy who was planning on paying half the rent) slept with your girlfriend and now you never want to speak to him again, let alone share an apartment with him. Life happens, and sometimes plans change. So now you just pack your stuff and leave, right? Unfortunately, your landlord might have other plans and your lease might hold you'responsible for thousands of dollars in rent. Gotcha! 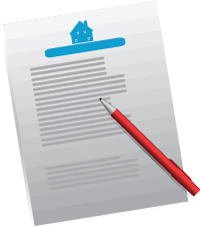 Your lease will have a specific time period outlined. Most standard leases are written for for a whole year. When you sign the lease, you agree to pay rent for the entire lease period. So, if the lease goes until June and you want to move out in February, you are responsible for paying rent during those four months - even if you move out. Some landlords will work with you. If they can rent the apartment to someone else, they may let you out of your obligation. Or, they may let you "sublet" the apartment. That means that you will find someone to rent the apartment for the remainder of your lease. You are still ultimately responsible if the sublet tenant doesn't pay the rent, however. And check your lease; some landlords allow subletting. Others don't. When you originally leased your apartment, you probably threw down a cleaning deposit. Some deposits are as low as $100, others can be as high as one month's rent. You might be thinking of your cleaning deposit as money you have coming to you when you move out, but you might want to think again. There are two major "gotchas" associated with these deposits. First, the whole deposit may not be refundable. Some property owners have their apartments professionally cleaned when tenants move out. They plan on paying that cleaning fee with part of your deposit. Look over your lease to see what amount of your deposit is non-refundable, and kiss that money goodbye. Second, the refundable portion of your cleaning deposit isn't an automatic refund. If the landlord doesn't like the way you left the apartment, he'll keep some or all of your money. Some landlords require a basic general cleaning (the sort of cleaning you probably did if your parents came to visit, or if you planned on bringing a date home). Other landlords have an extensive list of items that need to be cleaned that may include wiping down walls, replacing stove burner drip pans, cleaning light fixtures, etc. You'll probably receive detailed instructions regarding cleaning when you give your notice. Follow this list closely if you want the entire amount of your refundable deposit back. So you're walking home from school one day and this adorable puppy follows you. And it's obvious that the little guy is homeless, and hungry. And he looks up at you with those big, brown eyes and you just know there is no way you can call animal control and have him hauled away to the shelter. So you bring him in, feed him, name him and live happily ever after. Until the landlord shows up to fix the leaky faucet and notices that there's dog hair everywhere and a couple puddles. Gotcha! If your lease says "pets not allowed" then pets aren't allowed. You could get stuck with a huge fine. Or you and Scruffy could get evicted (and sent a bill for new carpeting) And if the lease period isn't up, you could end up paying the rent for the remaining months (see Length of Lease, above). Maybe pets aren't your problem. Maybe you're so cool that everyone wants to live with you. The more the merrier, right? Wrong. Check your lease. There's probably a section that states how many people will be living in the apartment. If you add more people and the landlord catches on...gotcha! He can charge more rent for more people. Or he can kick you out. Enjoy your new place. And your new responsibilities. Just make sure you know exactly what you're getting into when you sign the lease. Don't be afraid to ask questions. And get everything in writing. Avoid those "gotchas" and maybe your only surprise will be how much you love living on your own. Catherine Steele is a freelance writer living in Salt Lake City, Utah. She's rented many apartments, and never once been evicted.